One of over 200 FREE mini-love-lessons touching the lives of thousands in over 190 countries – worldwide! Synopsis: This mini-love-lesson tells about how you can help your brain help you do love and do life better, healthier, happier, more knowledgeably and more successfully via limbic system health acts. WOW, is your brain tremendously important to absolutely everything important to you, including your love life. Are you aware that the better you treat your brain the better your brain can help you with everything important to you. All your thinking, all your feeling, all your doing, all your health, all your work, all your fun and especially all your love and love relationships are affected by your brain and can be affected by its health. Do you know that if you help your brain be healthier, your brain can help your love relationships be healthier, happier and more successful. Maybe you are asking “how can I help my brain be healthier?” Then maybe you are also asking “how does a healthy brain make for healthier love”. To answer those questions we need a little brain and love background knowledge. Your conscious thinking mind and your loving heart are actually in your brain. Your thinking brain resides largely in your brain’s cerebral cortex and your loving heart in the circuitry and components of your limbic system. Your cerebral cortex is thought to be your more recently developed, outer layer brain. It wraps around and covers your limbic system which is a deeper, older, inner layer brain system sitting atop your more basic functions and oldest brain system known as your “reptilian” brain or brainstem. It is mostly in your limbic system where love, loving and feeling loved are understood to be primarily, non-consciously processed (see “What Your Brain Does with Love – Put Simply”). The more you can help your limbic system operate healthfully the better it can process love. Then your limbic system can to a better job of sending its electrical and chemical messages throughout your body and the rest of your brain where they do lots of health-making good. Those messages from your limbic system also help you feel and become consciously aware of the many different positive emotions associated with love. When that happens you can add conscious thinking about love and use whatever you have learned and understand about love to influence your love relationships behavior. If your knowledge-base about love is weak, poor, misinformed, contradictory conflicted, etc., as it is with so many, your actions concerning love likely will be the same. If instead your knowledge base about love is strong, rich and well-informed, love success becomes much more likely. That strong knowledge base also will help you with raising into conscious awareness your subconscious bad programming about love and how it works to sabotage you. Almost everybody has at least some bad love programming. However, making improvements only may work well if your brain’s limbic system is healthy and operating well. The more your thinking brain can know and work well with your limbic, non-conscious, loving brain the better. Not only can your loving heart’s limbic system help you with your love relationships, it also can help a great deal with your all over health, not to mention your general happiness, creativity, energy, efficiency and life spirit. To help your brain accomplish all that, ponder the following closely. Your limbic system is made healthier by healthy, real, love stimulations coming into it. That is what the research evidence increasingly points to. So, associate and interact a lot with those you love and those you are healthfully loved by. Then do the same with those you like and are liked by because that helps too. Include pets and perhaps those special experts on love known as dogs. Horses and cats are quite good too as are just about any mammal and also some birds especially parrots. Be actively involved with an adamant love (see “Adamant Love – And How It Wins for Us All”), altruistic love, spiritual love or a passionate purpose where you are focused on doing some kind of good thing. One of the great surprise discoveries in love research was the finding that giving love makes your body healthier in big important but different ways than does getting love. Learn about and get good at healthy self-love (see “From Self-Love to Other Love and Back Again”) Those who are good at healthy self-love are better at loving others and far better than the love malnourished, love starved and false love addicted (see “Does ‘Feeling in Love’ Come from Real or False Love” and our Real Love, False Love e-book). Remember, you can live the great admonition “Love Others as You Love Yourself”. Limit your time with the unloving, non-loving, false loving and anti-loving. Such people can be quite harmful to your relational and psychoneurophysical health. If you choose or have to work with or be around the less loving or those who seem to be just plain negative, counterbalance it by being with those of love as much as you can. Nothing seems to be as good for your limbic system health as having a personal life full of getting and giving love and just being around love. You likely will live happier, healthier, longer and be so glad you did it that way. Negative to Yourself? Take the Cure! If you suffer from what is known as automatic negative self thoughts, know that you probably are dosing your limbic system and maybe your whole brain with toxic and brain harming neurochemicals. Know also this could cause your limbic system to malfunction. And that likely would negatively influence the way you behave in your love relationships. Also, that probably would sabotage your self love too. So, if automatic, negative thinking about yourself is a problem, you had best learn to counter those negative self thoughts and negative self talk by replacing them with accurate, self positive thinking and talking (see “Love Positive Talking”). It is amazing what we are discovering about how we think and feel about ourselves changes our neurochemistry and influences our body’s physical health and our brain health. The faster cure for automatic, negative, self thoughts is time with a good counselor, therapist or personal coach along with a good bit of self positive homework practice. With the help of brain imaging technology, we can see your limbic (loving heart) system’s neural networks activate, or light up, when you do certain thinking things concerning love. We also can see your brain circuitry begin to change as you keep doing that. Furthermore, we also can analyze your blood before and after you do those certain love-focused, thinking things and measure the chemical changes that have occurred. What has been discovered is astounding. If you train and become able to do certain kinds of love-oriented meditation focused on those you love (which can include yourself) your limbic system lights up, circuitry changes occur in your brain and the neurochemical measurements get healthier. The more you do that sort of thing the more your limbic system perhaps seems to be practicing love and getting healthier as it does so . That in turn is thought to influence you to act more lovingly, which then in turn results in better love relationship functioning. The work of the neuroscientist, Dr. Richard Davidson, in his studies of loving kindness and loving compassion meditation, and the research into love by ethnologist and brain researcher, Dr. Helen Fisher, are particularly impressive here. All that is what recent and ongoing research is pointing to. Lots more has to be learned and confirmed but that is the way it looks so far (see “What Your Brain Does with Love – Put Simply”). A tentative conclusion is the more you focus on love, meditate on love, learn and think about love and practice the behaviors of love the better. Most likely your brain and especially your limbic system will function better, your body will be healthier, you will live longer, you will live happier and more effectively and all your love relationships will improve, even if they already are good. 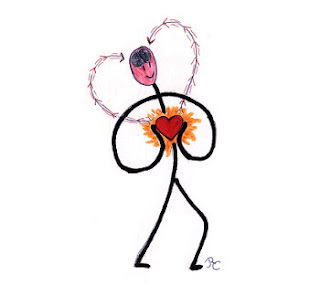 So, you meditatively might want to send your loving heart limbic system a message from your thinking self that says you love it, you are in awe of it, you respect it and are very thankful for all it does for you. You also might want to send it the message that you are going to treat it as good as you can learn to do. Eat for wellness. Your loving heart limbic system does best with whole grains, vegetables, fruits, nuts, lean meats and especially with just about anything having omega-3 in it. Particularly do not act against your loving brain’s health by eating saturated fats and all those other things they tell you are not good for you. For the good of your brain, you might want to check out the Mind Diet, the DASH diet, the Mediterranean Diet and also check out the colorful plate eating approach. Limit your alcohol intake. That is because alcohol gets in your blood and circulates through your brain where it can damage and kill brain cells including those in your limbic system. Breathe for wellness. Your brain needs a lot of oxygen – clean uncontaminated oxygen. Without good oxygenation, your brain including your limbic system functions poorly or worse. If your life is pretty sedentary, you probably are going to do better by doing short, deep breathing exercises every day unless you live where there is a lot of air pollution. Yoga breathing exercises often are recommended. If you are a good swimmer, you might do a lot of that using all of the different stroke styles (even if you are not a good swimmer, swimming is a good, full body, respiratory stimulating exercise). Any kind of exercise that gets you breathing more is worth considering. Aroma-therapy combined with deep, slow, calm breathing also is proving to be quite helpful to the brain. Lavender and chamomile scents for relaxation and distressing, citrus and mint scents for action, energy and mental sharpness often are recommended. Sleep for wellness. 7 to 9 hours of sleep is about right for most people. A 30 minute, siesta nap and power napping seems to help a lot for many. Lowering the temperature and raising the humidity has been known to improve deep, restful sleep. Make your sleeping environment good and you are likely to be helping your loving brain to rest well. Exercise for wellness. Your brain including your limbic system does best with a lot of good blood circulation. That happens with good exercise. For figuring out what is the right exercise for you it is best to consult with those who might know. Exercise specialists, physical therapists, sports physicians, personal trainers and of course other medical doctors and nurse practitioners who may have special positive brain health care knowledge. Walking is widely recommended, unless there are physical prohibitions. Many health care professionals suggest a 30 minute walk wearing good, supportive shoes most days of the week for possibly tremendous mental and physical benefits. Do Positivity Meditation for wellness. For at least a few minutes every day, go where things are calm and devote yourself to meditating about that which is positive. This can be done with positive focused prayer, slow gliding movement exercise, positive visualization exercises, uplifting melodic music, any kind of beauty appreciation and most of all love focused meditating. Fun, stimulating, challenging brain games and brain exercises can be found free and in abundance on the internet for another way to love your brain and promote brain health. My love and I record the TV quiz show, Jeopardy, then watch an episode each day; we have great, relationship fun while not being upset when we do not know an answer and congratulating each other when we come up with the right answer. Readings in the newer field of positive psychology also can be assistive. To learn more you might want to read The Compassionate Brain by Dr. Gerald Huther, The Brain in Love by Dr. Daniel Amen and The Neuroscience of Human Relationships by Dr. Louis Cozolino. Remember the song line that says “what the world needs now is love sweet love”? Ergo, are you doing your part by being about love? You must be at least somewhat about love because you are reading this mini-love-lesson. Consequently, I suggest you congratulate yourself for that and do some more. Perhaps you know someone you would enjoy sharing and talking to about this mini-love-lesson and this site where there is so much knowledge about healthy, real love and the how to’s of love success plus remember all these mini-love-lessons are totally free. 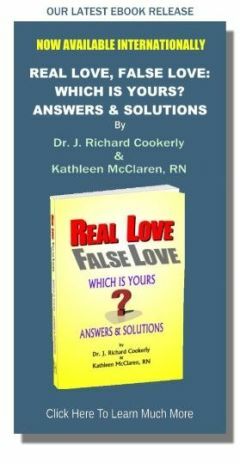 ♥ Love Success Question: Do you feel good learning about love? (If so, your limbic system is probably helping and do some more. If not, you might want to figure out what will make that better as an act of healthy self-love).